Ojai, California is the quintessential peaceful California town that time seems to have forgotten, a sleepy Bohemian village with a unique, artful flair. Ojai is home to world-class golf courses, art galleries, boutiques, fine restaurants and a variety of festivals and events for every season. On a recent visit we checked into The Emerald Iguana, a fanciful small inn that offers all the special amenities to make a restful escape or romantic getaway a perfectly memorable experience. 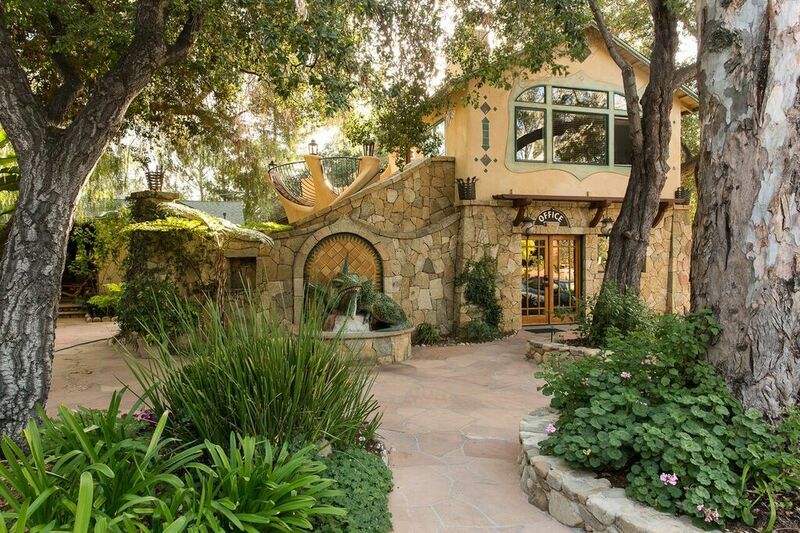 You enter this magical place through hand-carved stone pillars, under a canopy of live oak, sycamore and pepper trees, into a peaceful green garden oasis that is meticulously manicured. 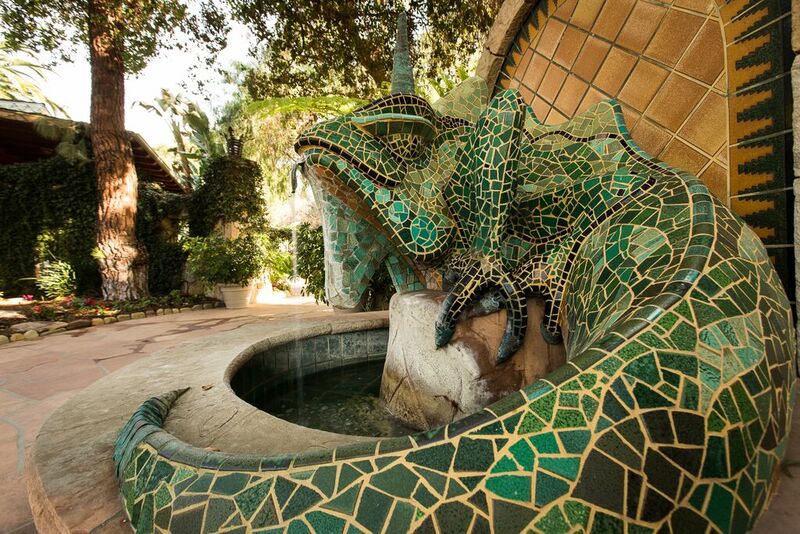 A cascade of soothing water gurgles from the mouth of a magnificently-tiled Emerald Iguana fountain, welcoming visitors to Ojai’s most enchanting hotel hideaway. We were pampered in the cozy luxury the light-filled Lilypad Suite, a spacious two bedroom, two story aerie with unique handcrafted furniture, cool tile floors, fireplace, full kitchen, fine linens and tranquil artistic surroundings. A thoughtful bottle of excellent local wine and a box of signature Iguana chocolates greeted us on arrival. We soaked up the fresh air and sunshine on our patio or deck and refreshed in the crystalline pool. We pampered our body and soul with a relaxing in-room facial and massage. The Emerald Iguana offers accommodations unlike any other hotel. 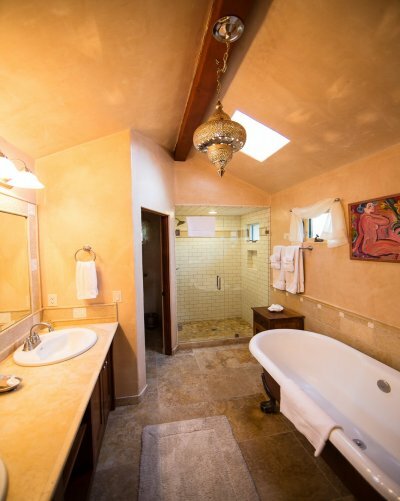 Just 13 rooms and suites in all, expect peaceful, artistic havens, filled with luxury amenities like plush bathrobes, hairdryers, coffee pots, complimentary wireless internet, and original artwork by Ojai artists, all of which are for sale. Owner Julia Whitman, obviously a woman of refined tastes, traveled to Europe and Asia to find the one-of-a kind pieces, rugs and exotic touches to create the inn’s exotic decor. 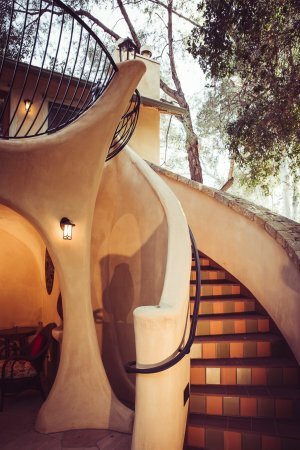 Her husband, Marc, is the leading architect in the area, and can claim credit for enchanting craftsman/art nouveau-style architecture. Extensive stone and tile work are accented by dramatic archways, all influenced by Mr. Whitman’s fascination with Spanish surrealist Gaudí. 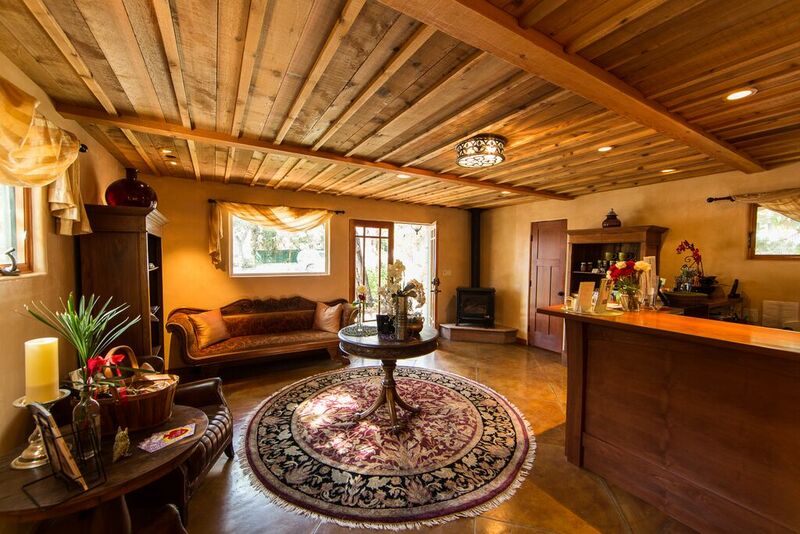 Wonderful hideaway cottages are perfect for the extended stay traveler. These cottages offer one or two bedrooms with fully equipped kitchens. The goal here is to make your extended stay even more comfortable than home with added restfulness and service. A deluxe complimentary continental breakfast of orange juice, bagels, English muffins, cereals, hard-boiled eggs, yogurt, and fruit is served by the pool daily with a view of the towering Topa Topa mountain range and daily newspapers included. 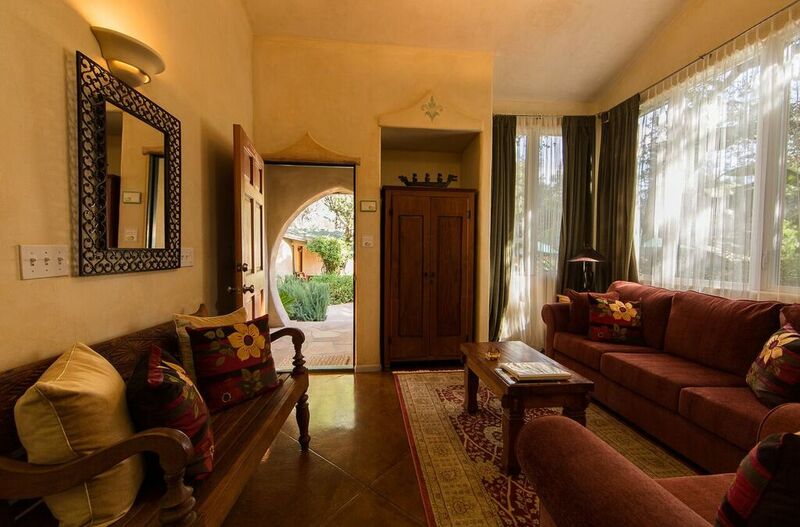 More than any other Ojai hotel, the Emerald Iguana Inn is a destination filled with romance that provides a tranquil retreat for the discriminating, a finely-tuned boutique hotel that offers relaxation, calm, privacy and the opportunity to rejuvenate your mind and spirit in luxury and comfort. If you are looking for a unique oasis with timeless, charming beauty, this is surely the heavenly hotel for you. The young staff is cheerful and efficient. Visit http://www.emeraldiguana.com. Rooms can start as low as $159 a night with a two-night minimum and guests with children under 14 are referred to their sister property, the nearby Blue Iguana. Beautiful downtown Ojai is an easy few minutes walk, where you will find art galleries, the Arcade specialty shops and boutiques, and fine gourmet dining. The outdoors is always beckoning with a delightful climate and Ojai as the starting point for miles of trails, parks and points of interest. Nestled in an idyllic valley approximately 45 minutes from Santa Barbara, Ojai is bordered by the spectacular Los Padres National forest. Close by Lake Casitas offers miles of magnificent shoreline teaming with wild bird-life and boasts excellent fishing. Abundant orange and avocado groves line the valley.